AD PRO, Architectural Digest’s home to design industry news and trends, featured the recently redesigned Knoll New York Home Design Shop. In his weekly roundup of news to know, writer Timothy Latterner chose the retail shop as must-see space for design enthusiasts. Designed by Barbara Reimelt of The Nintey Nine Group, the Knoll New York Home Design Shop reimagines Modern, combining classic and contemporary designs from the Knoll portfolio. The space, “expresses Knoll’s signature modern style in a more relaxed, home-centric setting,” writes Latterner. 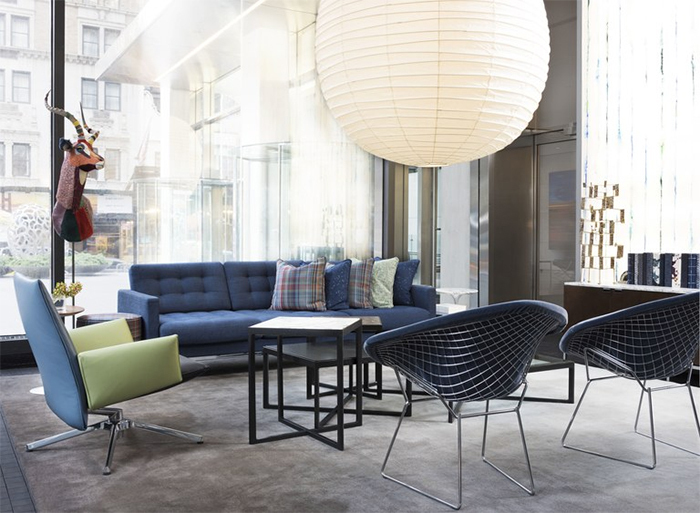 “Signature pieces were reupholstered, rearranged, and reimagined to show Knoll’s ability to bring out the best in a living room, dining area, or office setting with a vivid color palette and unique patterns,” making the New York Home Design Shop a top destination.